In the days leading up to ESPN’s Martial Combat on July 14-15, 2010 at Sentosa Island World’s resort casino, Tiger Muay Thai and MMA training camp, Phuket, Thailand fighter Claire Haigh and Ray Elbe were busy with the media. 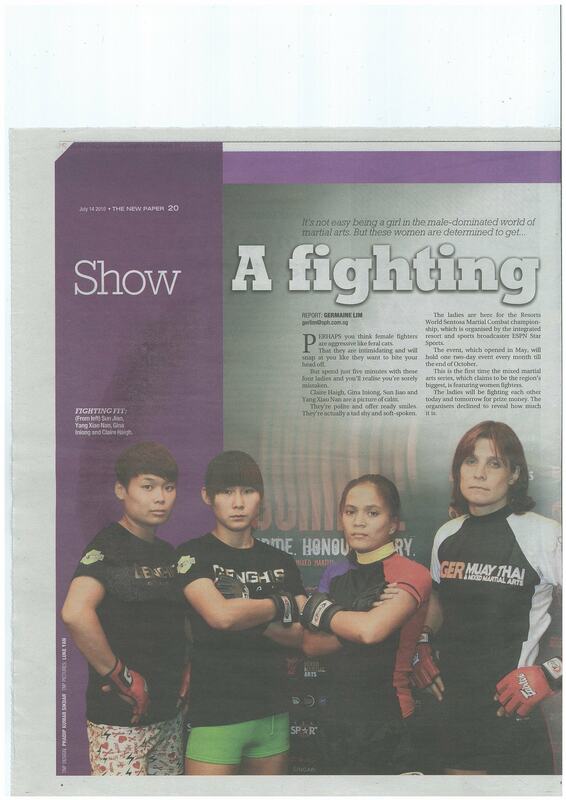 While Elbe was talking to Singaporean’s on the airwaves of local radio about his upcoming superfight against Alan Fernandez, India’s #1 ranked MMA fighter, Claire was busy doing TV interviews and an article for the Strait Times, Singapores popular English newspaper while she arm-wrestled a man. Check out the articles from the news paper below.